Wangan Midnight Maximum Tune 3 vastly improves upon its predecessors, with the driving game including a more enriched plot line which features more rival driver chases, as well as mid track events to keep the player on their toes. The head to head option is up to 4 players, and the versus system has been updated to include bisect selections. This means that there are multiple ways to complete the course. To add to the competition, only the leader of the race gets to choose which way to go at the junction points, and the rest must follow. There are 6 new cars include Mitsubishi Lancer Evolution IX MR, Nissan 180SX, Mitsubishi Lancer GSR Evolution V, Toyota Aristo, Mazda Speed Atenza and the Subaru Impreza WRX STi GDB. The new tracks include Wangan-Line, Yokohane-Line and Osaka. Another of the major improvements is ghost mode. After the player races on one of the tracks designated as a ghost track, the machine records the time, and more importantly, the players driving style. When playing ghost mode, the player may summon any ghost car. This can be done via a menu which sorts players by name and rank, and allows the player to race against an almost unlimited number of virtual opponents. What makes this a true breakthrough is that the ghost car does not always follow the the exact same path. The machine does not simply recreate a mirror of how the player did drive the track, rather it is a representation of how that player would drive it if he was sitting next to you. The ghost mode means you can even race yourself, with the ghost car automatically controlled by the computer but driven exactly like the player does for the ultimate in head to head. The more you play the more the machine learns, and if you get better your Virtual You will improve as well. The ghost mode is available on 6 different tracks, with the fastest of all players awarded the crown for that stage. Wangan Midnight Maximum Tune 3 vastly improves upon its predecessors, with the driving game including a more enriched plot line which features more rival driver chases, as well as mid track events to keep the player on their toes. The head to head option is up to 4 players, and the versus system has been updated to include bisect selections. This means that there are multiple ways to complete the course. To add to the competition, only the leader of the race gets to choose which way to go at the junction points, and the rest must follow. There are 6 new cars include Mitsubishi Lancer Evolution IX MR, Nissan 180SX, Mitsubishi Lancer GSR Evolution V, Toyota Aristo, Mazda Speed Atenza and the Subaru Impreza WRX STi GDB. The new tracks include Wangan-Line, Yokohane-Line and Osaka. Another of the major improvements is ghost mode. After the player races on one of the tracks designated as a ghost track, the machine records the time, and more importantly, the players driving style. When playing ghost mode, the player may summon any ghost car. This can be done via a menu which sorts players by name and rank, and allows the player to race against an almost unlimited number of virtual opponents. What makes this a true breakthrough is that the ghost car does not always follow the the exact same path. The machine does not simply recreate a mirror of how the player did drive the track, rather it is a representation of how that player would drive it if he was sitting next to you. The ghost mode means you can even race yourself, with the ghost car automatically controlled by the computer but driven exactly like the player does for the ultimate in head to head. The more you play the more the machine learns, and if you get better your Virtual You will improve as well. The ghost mode is available on 6 different tracks, with the fastest of all players awarded the crown for that stage. Wangan Midnight Maximum Tune 3 puts players in the racing car seat of characters from the Wangan Midnight Maximum Tune franchise. 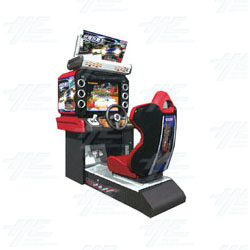 The racing arcade game features 3 playable characters in Battle Mode who follow different exciting storylines, and who can upgrade their cars as they progress.